10 x Assorted styles of Gold tone Necklace Chains. Fine Gold plated mixed chains, can include Curb, Rope, Figaro, belcher etc. chains. 10 x assorted GOLD tone fine Bracelets. 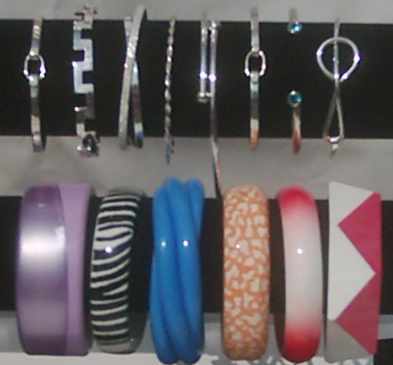 Various styles can be included from curb bracelets, belcher, figaro, rope etc. and other Gold tone bracelets. (Pack of 10). Assorted Pack of 48 x Assorted Designs of Fashion Jewellery Rings. 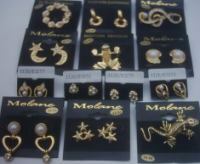 Complete mixed selection can include Gold tone, Silver colour, Childrens rings, Large Designs, Stone set, CZ etc. etc. (Product selection may vary from example images and all Packs contain different stock). 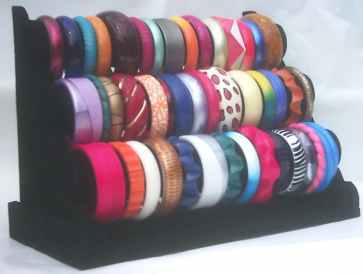 Assorted Wholesale Pack of 120 x Mixed Fashion Rings. Various Styles and Colours of Fashion Ring included. 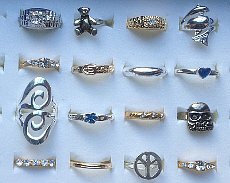 Every Pack is different and can include Silver tone, Gold plt, Coloured Rings, Crystal set, Large designs, Kids, Stone set Rings etc. (Product will contain designs not shown in example image, as every Pack is different). Gold Plated tone Clear Cut Crystal ring. Set with simulated Diamonte Cut CZ Stone. (Clear crystal stone). Assorted sizes supplied.